Early Birds who sign up before the 15th of November 2018 get a 10% discount. Students also get a 10% off. Friends who sign up together get 10% off each. Your voice could well be your hidden instrument to success! Come discover how to play to your vocal strengths and make it work for you at our Master Classes: The Wonders of the Voice. Come learn and experience first-hand how you can project, modulate, emote, intonate, use inflection, articulate, pronounce tricky words and bring characters alive with just your voice. Discover the wonders of your Voice and begin an exciting VO career that pays you to have fun! Wonders of the Voice - Where passion and profession come together! 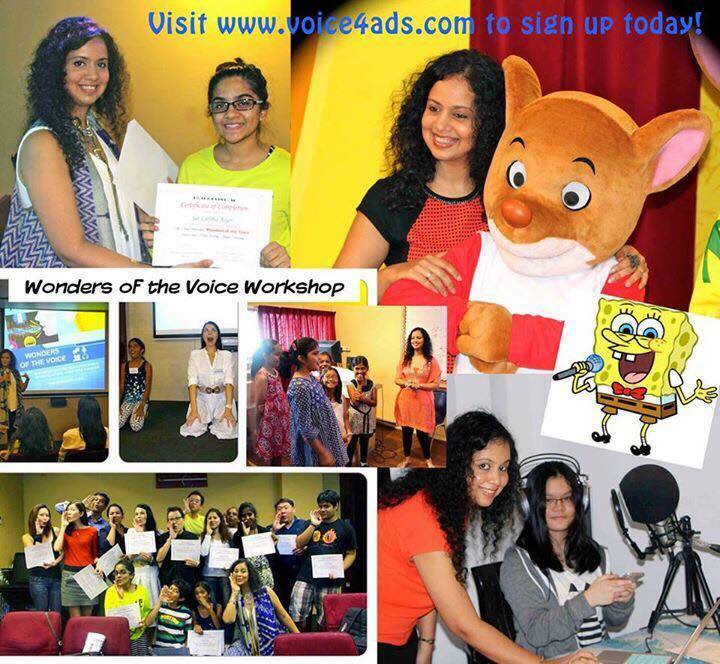 Voice4ads 'Wonders of the Voice' was launched in 2015 for aspiring VO Artists—adults, teens and youth with a great response! These master classes have consistently received top ratings from all participants with superlative feedback & testimonials on our website and Facebook page. We have run a session bi-monthly since inception. We offer the Beginner's Guide & the Advanced Guide & at the end of this two-day intensive session our participants walk away armed with their very first VO demo reel showcasing their versatility & are able to pitch for potential VO work immediately. Participant's with potential are also featured on the Voice4ads Voicebank & a few have made back their investment on landing their first paid VO job! Now that's value! Facilitator Credentials: Wonders of the Voice is run by Voice4ads founder/facilitator, Noella Menon. She is a seasoned Voice Over Artist, Author and Singer with over 20 years of VO, Voice Acting & Jingle experience. She has won awards & International recognition with wins like The Hollywood Film Festival, Gryphon Film Festival & Richmond International Film Festival. Credits include Script & Dialogue & Character Voices. She is the Voice of popular ad campaigns such as Malaysia Truly Asia, Vietnam Hidden Charm, Ponds, Pampers, Vogue Eyewear, Rolland Garros and whose voice has been featured on BBC, CNN, CNBC, ESPN Star Sports and Starhub. She has been featured in the media, online, radio and TV. She has also been called to conduct workshops on Creative Lateral Thinking, Meet the Author sessions & Voice Acting in Schools and Enrichment Centres in Singapore.